Wealthy industrialist and philanthropist Andrew Carnegie built an astounding 1,689 libraries around the United States — plus 660 in the UK, 125 in Canada, and 35 in other countries around the world — between 1883 and 1929. Preservationist blogger Susie Trexler wrote recently about the rich variation in architectural styles among Carnegie libraries in California, Oregon, and Washington. 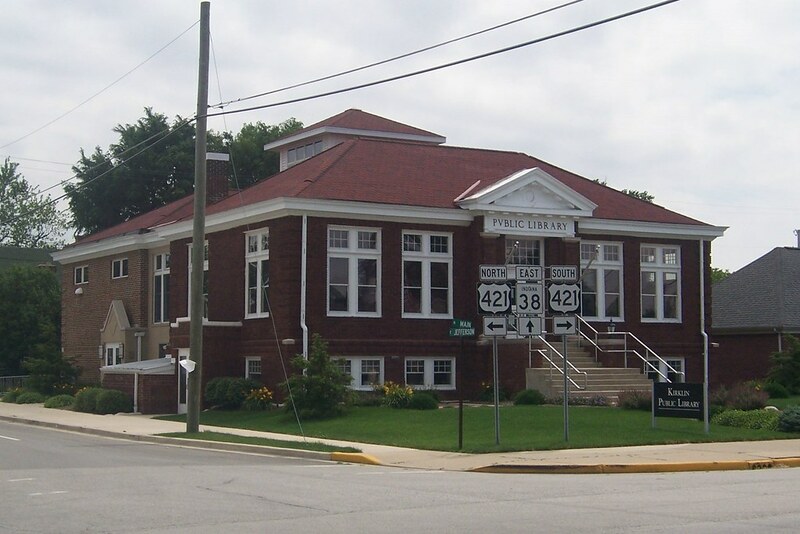 I was surprised to see how different from each other these libraries looked — because as I’ve encountered a handful of Carnegie libraries in my travels along Indiana’s old roads, what I’ve noticed is how similar they look. They all have some characteristics in common: prominent entrances, compact dimensions, brick construction, and usually pitched clay-tile roofs. 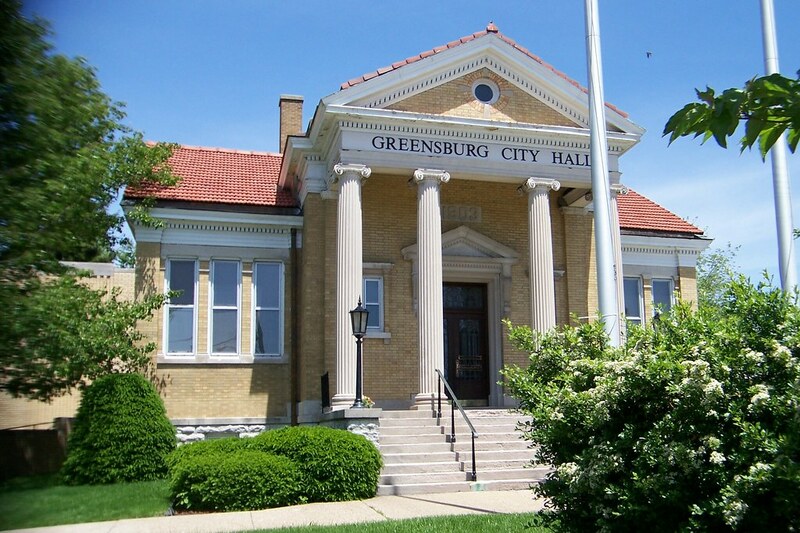 The first Carnegie library I ever encountered was along the Michigan Road in Greensburg. But I didn’t know what I was looking at. I just thought it was a compact City Hall building. Completed 1903. Architects: William Harris, Clifford Shopbell, and others. I drove through again a few months later to find the City Hall sign gone, revealing what you see below. 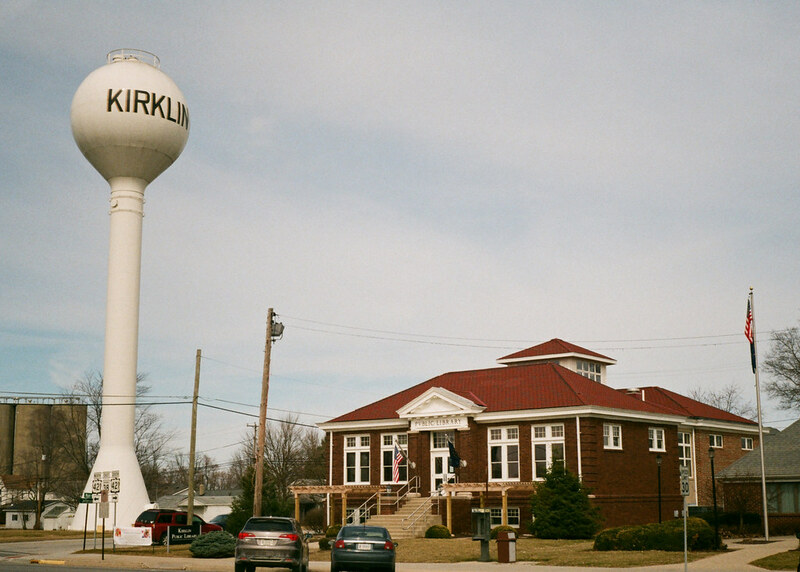 (The town built a new City Hall elsewhere.) I’d not heard of Andrew Carnegie’s libraries then. Seeing this sent me to the Internet to research. That’s when I learned that Carnegie’s efforts saw 167 libraries built in Indiana between 1901 and 1918. Since I took these photos, this Carnegie Library has been converted into a private residence. Interestingly, the Greensburg Carnegie library is nestled into this corner. The Michigan Road is on the left. All of the other Carnegie libraries I’ve found around the state are parallel with their streets. This Carnegie “Pvblic Library” stands on the Michigan Road in tiny Kirklin. Notice the addition out back, which was built in 2001. I like how its style reasonably harmonizes, but I wish they’d taken greater care to match the brick. It’s still the town’s library. Here’s another photo of the Kirklin library, just because I like this shot. I found this Carnegie library on US 50 in downtown North Vernon. 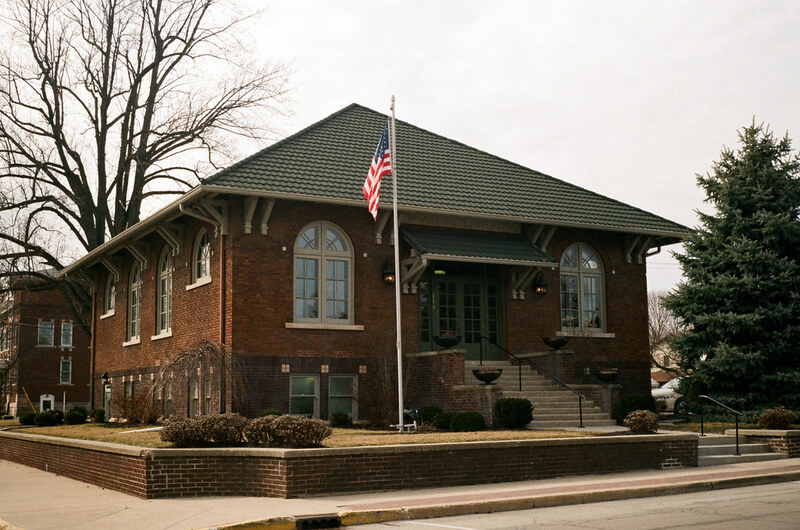 It is said to have been one of the last two Carnegie libraries built in Indiana. It was vacant for years, but was repurposed as North Vernon’s Town Hall in 2012. 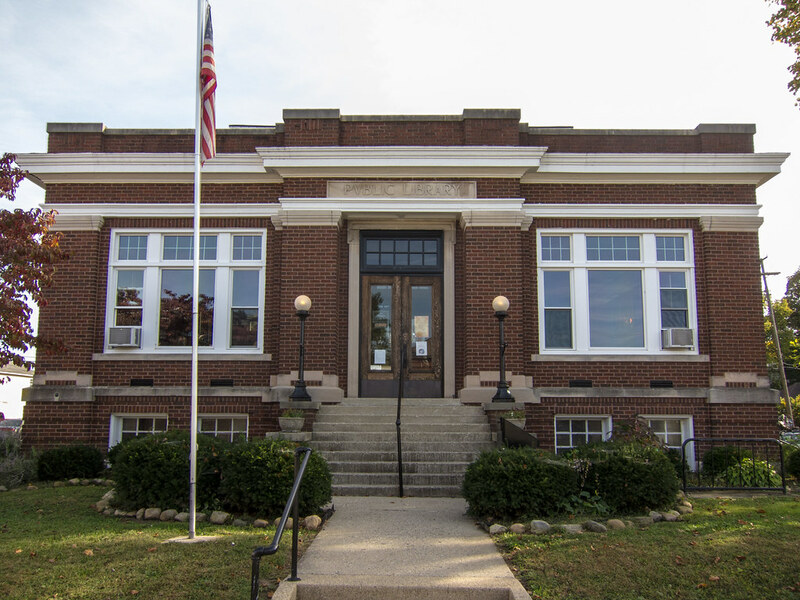 You’ll find this Carnegie library on the square in Paoli, on the Dixie Highway in southern Indiana. (This is the same town that lost its 1880 iron bridge last month thanks to a woefully inexperienced semi driver.) This is the smallest Carnegie library I’ve found in Indiana. My memory is that this building was being used as a day care or preschool at the time I took this photo, but I hear the building is vacant today. Here’s the Carnegie library in Sheridan, a small town north of Indianapolis. As best as I can tell, it’s vacant, but owned by an architect who is looking for a buyer who can put it to appropriate use. I really enjoy the look of this one. Completed 1913. Architect: Charles Bond. 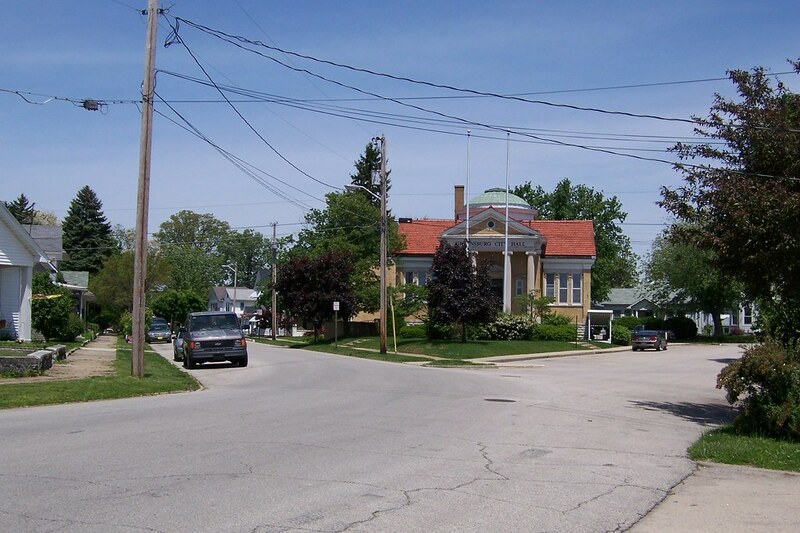 Finally, here is the Carnegie library in Knightstown, east of Indianapolis on the National Road (US 40). It’s the only one I’ve found so far without a pitched roof. It appears to still be the town’s library. There you have it: all the Carnegie libraries I’ve found across the state. Clearly, six out of 167 is hardly a representative sample: that’s just 3.6 percent of them! Maybe I need to make a focus of future road trips to visit them all across the state. In researching for this post, I discovered that the community center building two blocks from my church is a Carnegie library! I can start there. Until then, I can rely on Wikipedia’s list of Indiana Carnegie libraries. 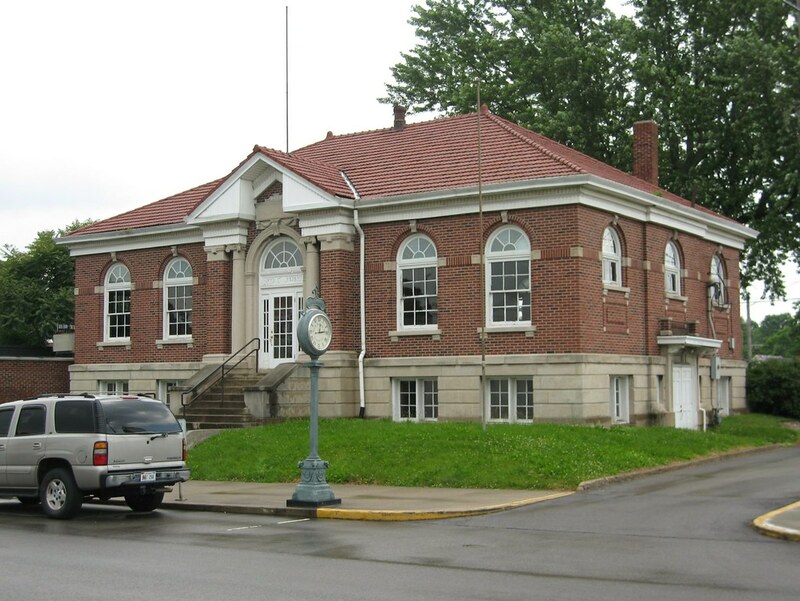 I do have one more Carnegie library in my photo archive: this one, in Greenup, IL, on the National Road (US 40). Such a different look from any of the ones I’ve photographed in Indiana! I learned about these years ago and have noticed them in small towns. What I had not noticed was how different one was from another. I will have to pay closer attention going forward. There are something like four of them right here in Indy! Wow, that I did not know. You learn something new every day here at Down the Road. Very cool, Jim. 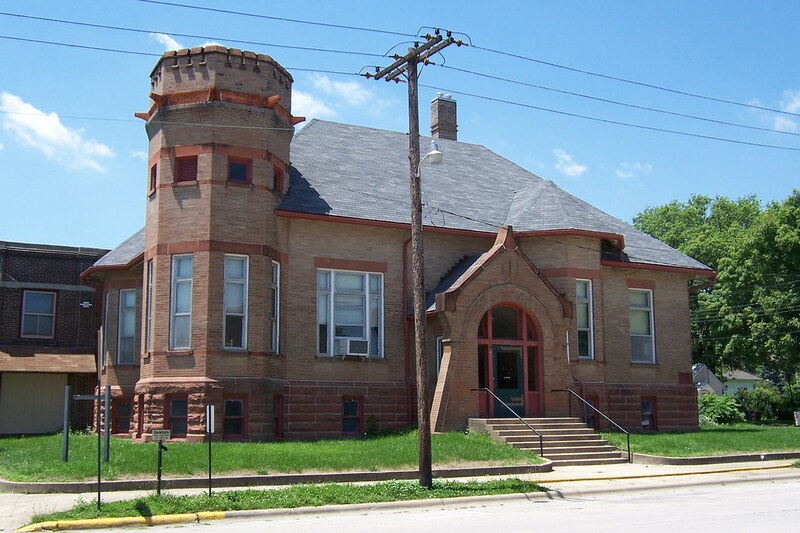 Sheboygan, the town I grew up in, received a Carnegie library grant, and I spent a lot of time at Mead LIbrary as a kid. The building was almost totally razed to make room for the John Michael Kohler Arts Center, but they left a portion of the original entrance standing (steps and tall Greek-style columns), and use it as a backdrop for summer concerts and weddings. It’s a nice memory of a place I enjoyed. Carnegie certainly did a lot of good for the country with his extensive library grants. Here’s a link to Sheboygan’s Carnegie grant – enjoy! Good that they at least saved the entrance. Sad that the rest is gone! I’ve never noticed any Carnegie libraries in the UK, but apparently there are 2 in the county I live in according to wikipedia, Will have to have a look. I smell a photographic opportunity! I would love to live in one of these libraries converted into a residence! That would be fun, wouldn’t it! I talked to the director of the community center near my church and she said that the building has two fireplaces! That’s got to be really cool. I’m surprised Terre Haute doesn’t have one. The one in Merom is not in great shape. Now I know why such a tiny town had such a large library building. Will have to look more closely the next time I’m there to see if it’s being used. I’m surprised too. Terre Haute seems like the perfect place for one. Had a look at the list of UK libraries but none near me down in the southwest (Cornwall). Wow, these are really cool examples! I especially like that once the City Hall sign was removed, the Carnegie Library lettering was visible. So glad that history often has a way of adding layers rather than removing things. I never thought of it, but I think you’re right! Adding layers, rather than removing. Thanks for stopping by. Unfortunately the Michigan Road signs were placed to follow US 421, which isn’t accurate through downtown. The Historic Michigan Road Association has it on its to do list to work with the city to fix that! 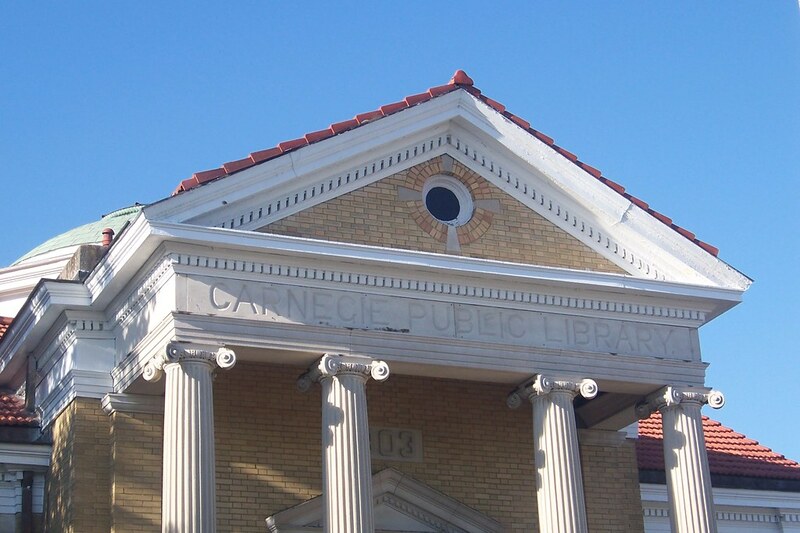 The first library I ever used was the Carnegie library in Tuscola IL. I last visited it back in the 90’s and it was still the same. Like stepping back in time. It is still used as a library although I don’t know if the inside has changed since I last visited. Danville IL still has a Carnegie although it is being used as a museum now. The small town of Ridgefarm had a Carnegie that was said to be the smallest of all the Carnegie libraries. It was still in use the last time I went by there. 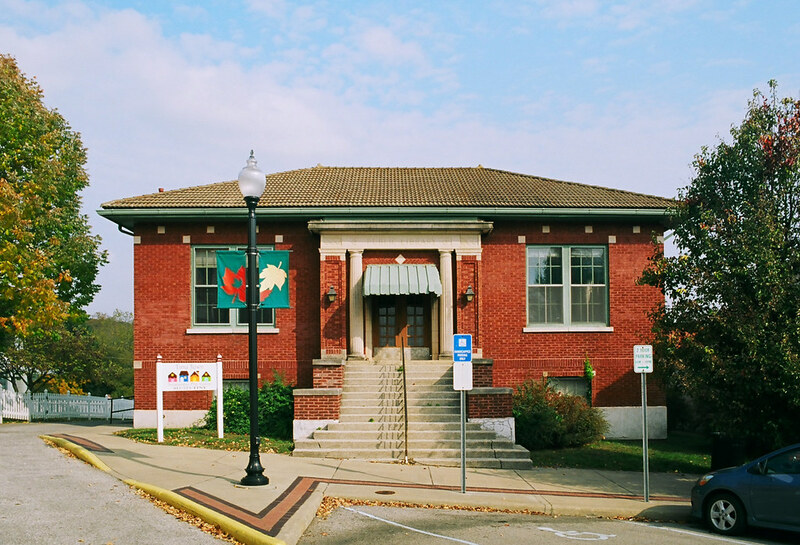 I believe Paris IL also has an active Carnegie library. With as many libraries as were built, I imagine we see more of these libraries than we realize. Very nice little Carnegie Library here in Dundas, Ontario Canada. They built a bigger library down the street in the 70s and it’s now an art gallery. Dundas…. Isn’t there a Dundas Rd. in Toronto? I think I’ve been on it. I’ve been to Toronto/Mississauga a couple times. Got the worst sunburn of my life at the beach on some little lake up there. Anyway, it’s great that your Carnegie library was repurposed so well. Yessir, our little town was an early industrial powerhouse due to the prevalence of streams and waterfalls to power mills and factories. Dundas Street starts in Toronto and terminates in the formerly very important town of Dundas. See http://www.woodyscarmel.com/. The Woody’s Library Restaurant in Carmel is a former Carnegie Library building. Interesting blog post! I remember spending many contented hours in the Jennings County Carnegie library, reading books by the light of those stunning windows. My mom took us to the library every Tuesday during Dad’s Rotary meeting. We’d check out an armful of books and then proceed to Burger Chef, where we happily read throughout the meal.I have so many warm memories involving our Carnegie library.